Even before jets were in service, the airlines already had advertising companies in full swing promoting “jet travel” as the wave of the future. Airplane model makers in the U.S., and especially in Europe, saw a surge of orders. 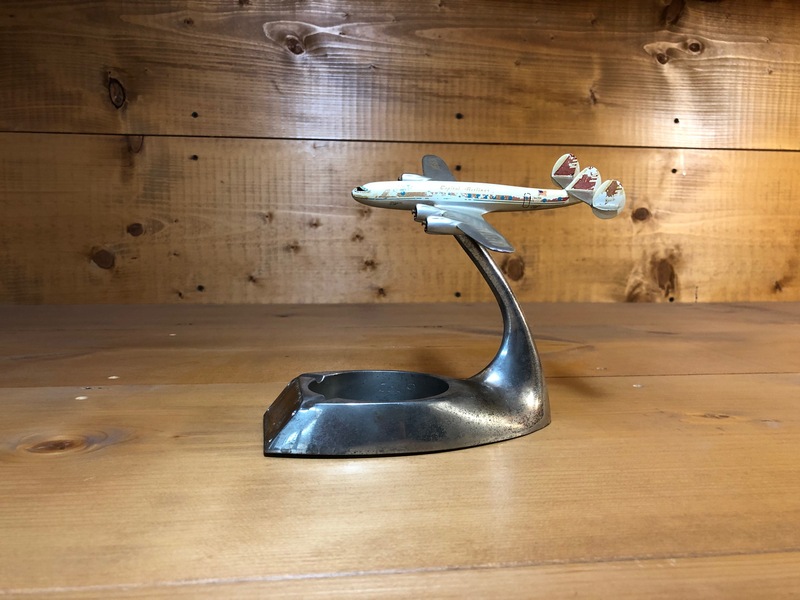 Models of jet airliners were needed by the airlines for display in ticket offices, travel agencies, and on airline counters at airports. These models stirred up excitement and anticipation in the air traveling public. Upon seeing models of the soon to be put into service jets, passengers started dreaming of what it would be like to fly in one of these sleek, fast, and luxurious airplanes. In England the new de Havilland Comet was all the rage. 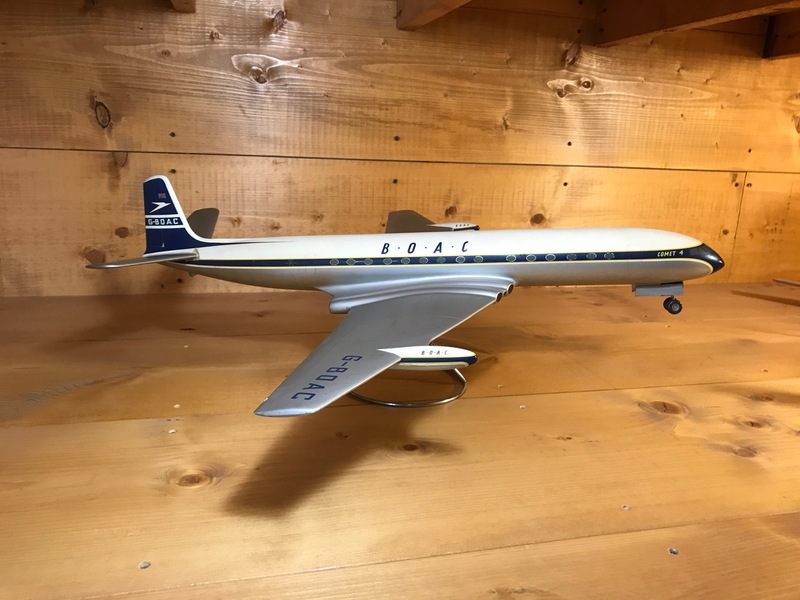 The Comet was about to go into service in 1952, and model makers in England such as Westway and Peter V. Nelson were already turning out aluminum models of the Comet prototype in BOAC markings. 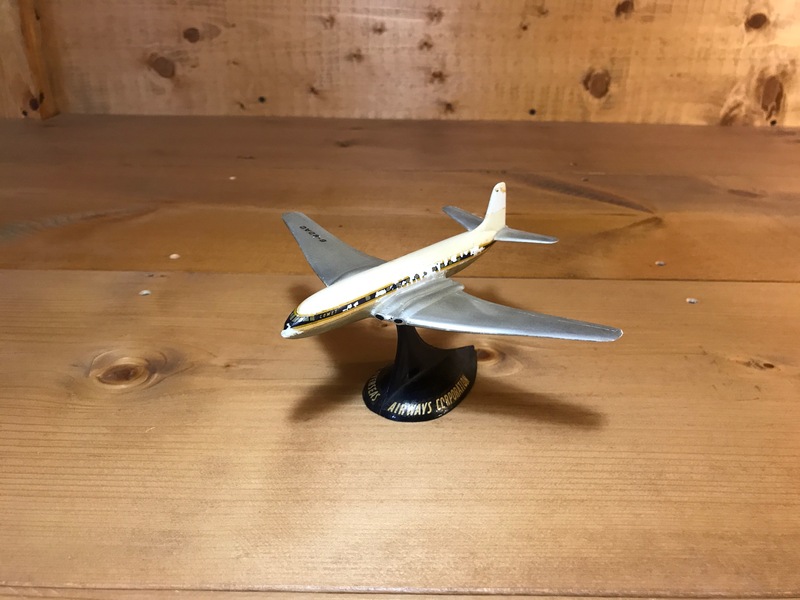 In anticipation of forth coming Comet service, BOAC had a small plastic “giveaway” model made for flight attendants to hand out on early flights. 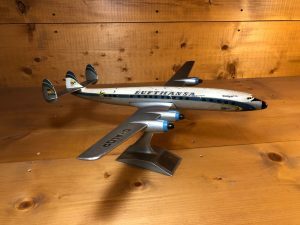 In the U.S.S.R. models of the new TU-104 were being made for Aeroflot by Soviet model makers. The TU-104 was the second jet airliner to be put into service. 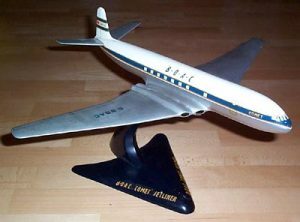 Models of the early TU-104s were made mainly by the Tupelov factory in house, but government commissioned models were also put on display. Early models were made of wood and primitive plastics. Later on injection molded models became available. 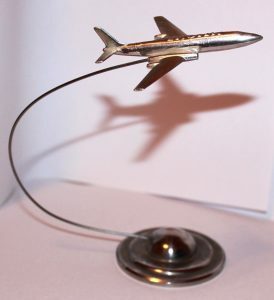 The metal models of early Soviet airliners were not made of aluminum. They were made of a very heavy Zinc based alloy. In the USA, in anticipation of the inauguration of jet service with the new Boeing 707, model maker Pacific Miniatures of Alhambra California produced large 1/50th scale models of the first series of Boeing jets. 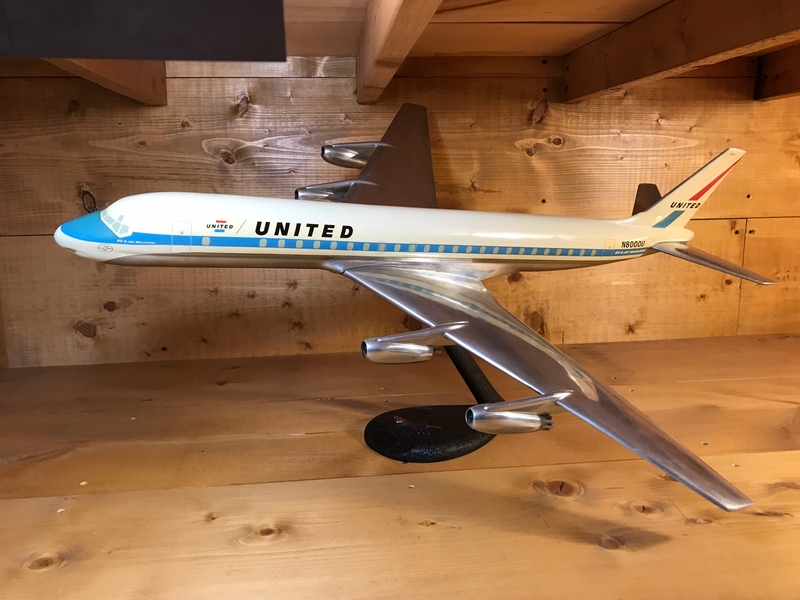 These models were big and impressive, and, they were pretty accurate considering that the actual airplanes had not yet been put into regular service. 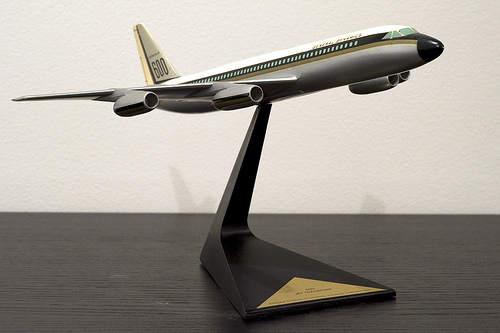 Early 707 models were based on drawings, artist conceptions, and speculation. 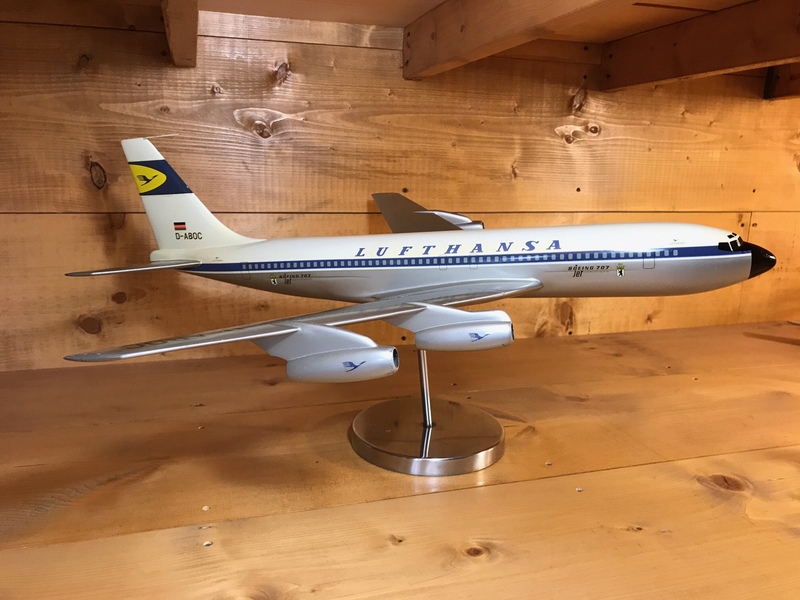 In Europe, Lufthansa Airlines in Germany bought early 707 models from companies like Raise Up of Holland, and Schaarschmidt in Berlin to promote upcoming jet service. Raise Up Models of Rotterdam Holland was a prolific model maker that produced thousands of models throughout the 40s, 50s. and 60s. Raise Up models however, did not take care to assure accuracy , especially in the nose, tail, and engine areas of their models. Many of their models appear almost “clown like”. The Douglas DC-8 entered into service in 1959. With much anticipation, model makers in the US and abroad went into action coming out early with DC-8 replicas. Obviously, the Douglas factory itself was quick to come out with models in numerous scales. Aluminum models in both 1/72nd and 1/50th were turned out, along with huge cutaway models mounted on floor stands. 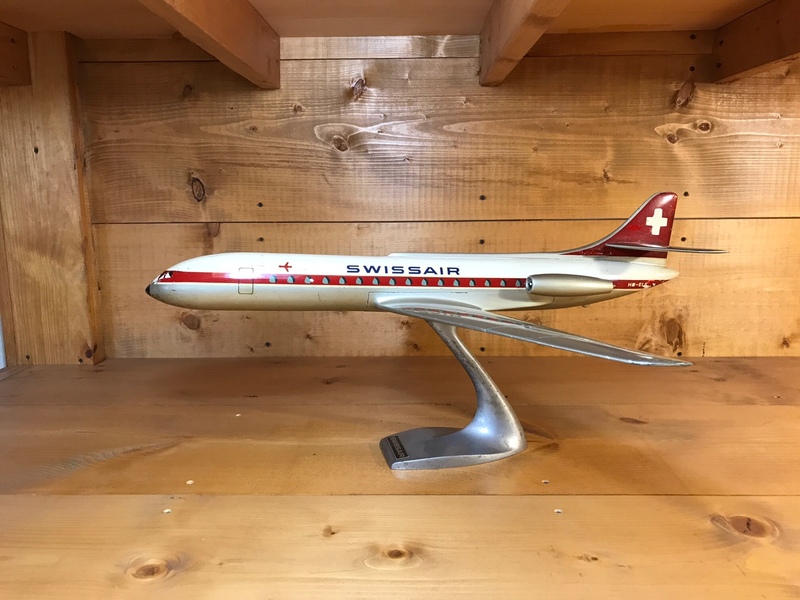 Raise up in Holland was quick to get on the DC-8 train, making 1/50th scale models to sell to airlines and travel agencies. The Caravelle went into service in 1959 with Air France and SAS. This new airliner was unique in having its’ jet engines mounted at the rear of the fuselage under the tail. It was a beautiful design, and numerous model makers produced Caravelle models. Raise Up Holland of course, and others like Fermo of Denmark and even Fond Nucci of Italy did Caravelles, just to name a few. 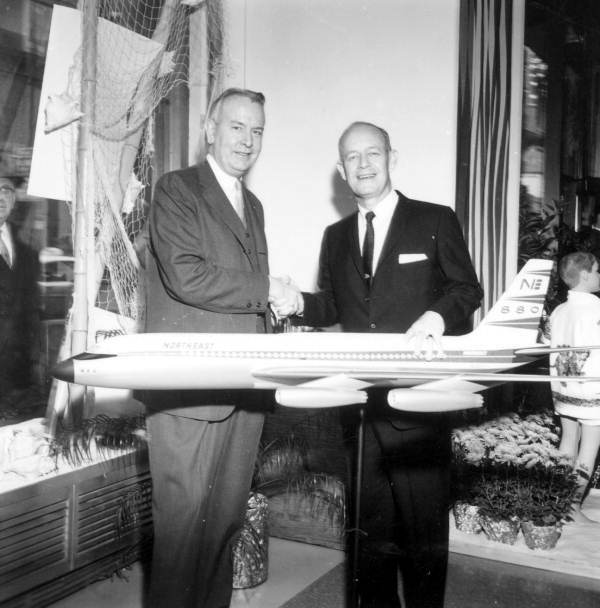 In 1960 the Convair 880 was put into service. 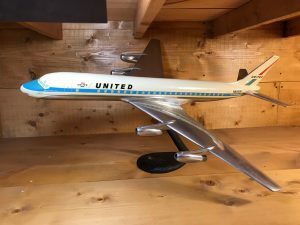 The 880 was a fast airplane that was slightly smaller than the early 707s and DC-8s. 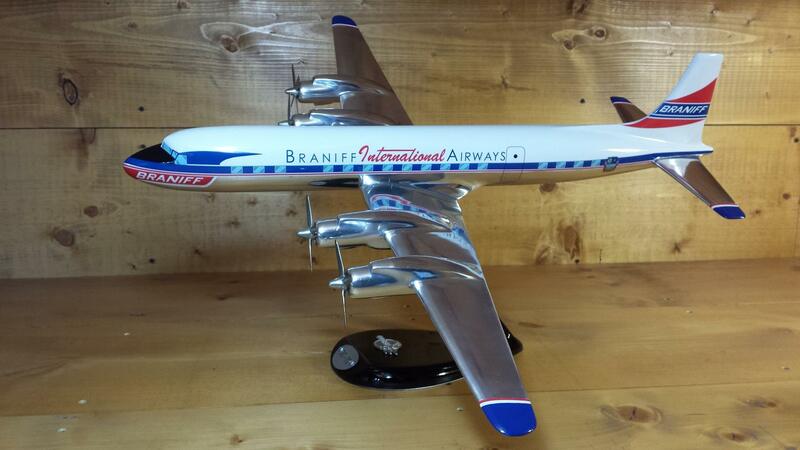 Models of the new Convair 880 were made by a variety of companies for the airlines that operated them. 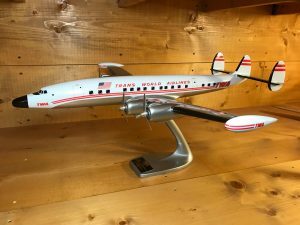 Convair itself made the most accurate models of the airliner in house. The factory models were made in 1/50th scale of modern molded plastics. Convair had a very distinctive triangular stand. Fermo of Denmark made a huge model of the 880 in aluminum, that could be displayed as a solid or cutaway model with a full interior. 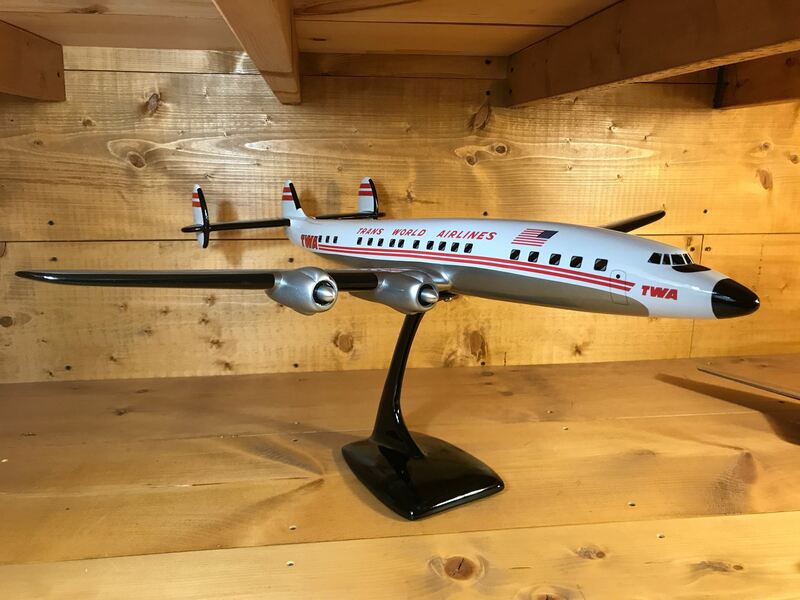 On the smaller side, a company called Riffe models in Kansas City MO made 880 models for TWA that were displayed on ashtrays or on a regular stand. 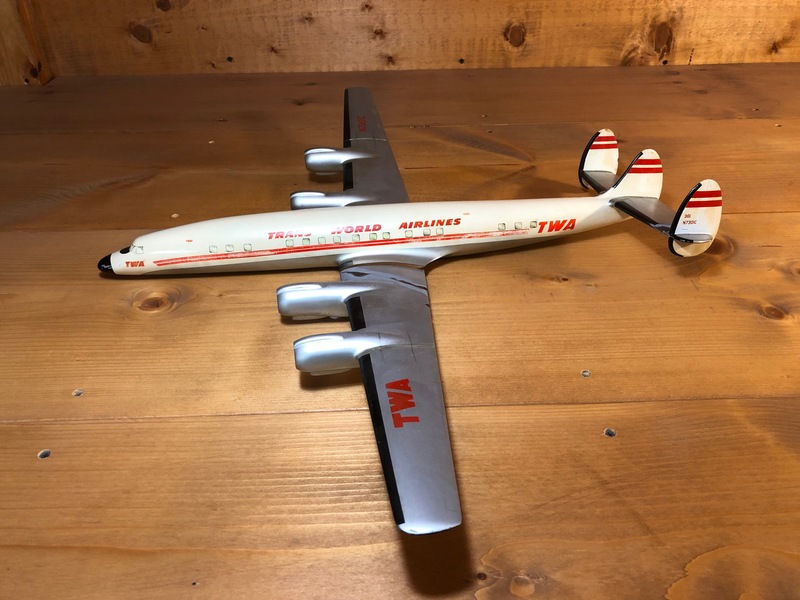 In conclusion, models played a big part in the ushering in of the “Jet Age” by the worlds airlines. Early airline issue models of the first generation jets will continue to be prized by collectors. 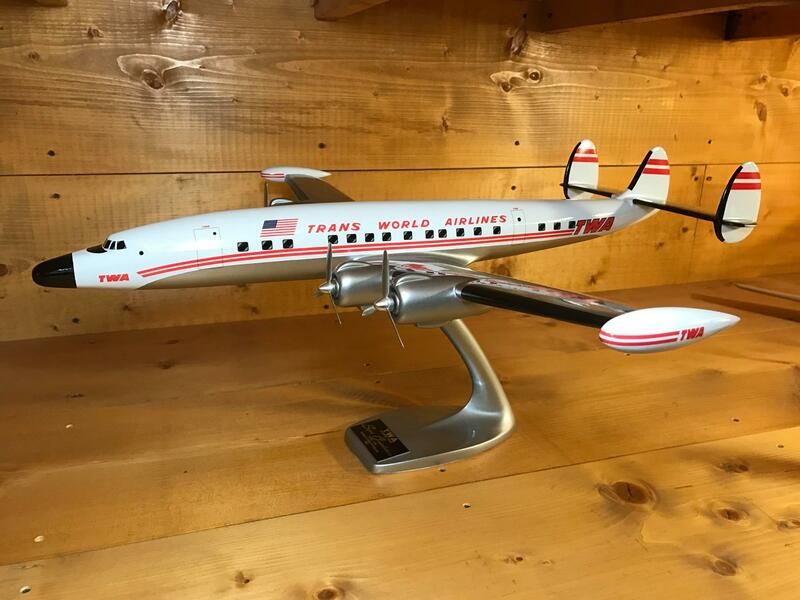 Airline issued models, otherwise known as “Airline Counter Models” or “Travel Agency Models”, have always been source of fascination for Airline enthusiasts. 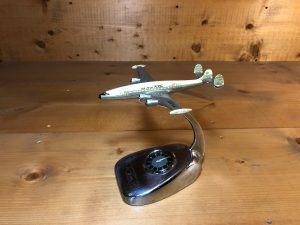 These models were manufactured for the Airlines by many notable model builders going back as far as the 1920s. 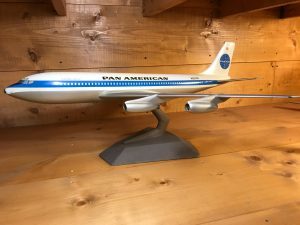 These models were first made of wood and were later constructed of aluminum and modern plastics. In this first article, I have decided to feature the models produced for the Airlines by the Douglas Aircraft Corporation, commonly referred to as Douglas Factory Models or DFMs. 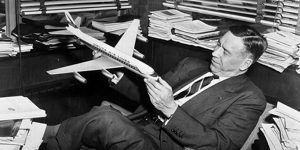 The Douglas Aircraft Corporation, was of course, one of the greatest Aircraft manufacturers of the 20th Century. Douglas also had the foresight to provide its customers with very high quality models for sales promotion and advertising. 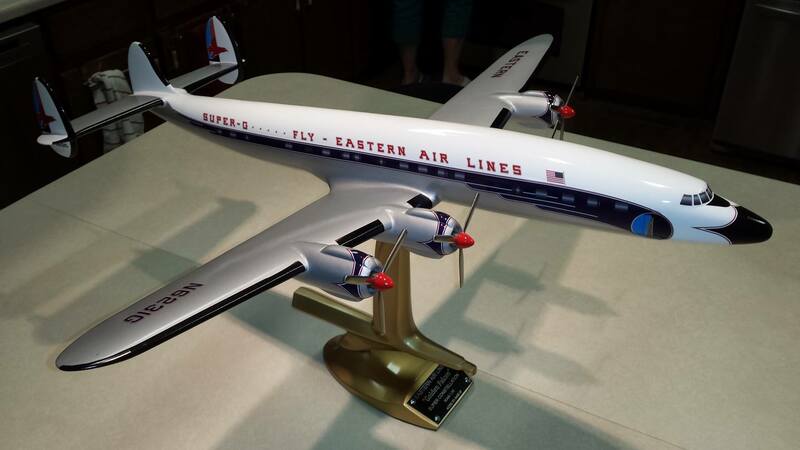 Models were given to Airline companies that purchased airplanes from Douglas. 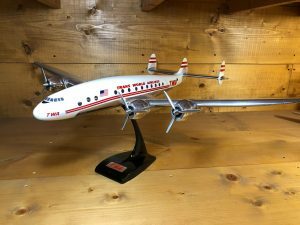 Extra models could be purchased by an Airline to be displayed in Airport terminals, Airline ticket offices, and Travel Agencies. Donald Douglas, Jr., the son of company president Donald Douglas, Sr., is said to have taken an interest in establishing a factory model shop about the time the DC-2 was being developed. A Douglas factory worker, Victor Pastushin, a Russian immigrant, was at the same time already producing ashtray type models on his own. Pastusian is likely to have had some influence on Douglas management, and Donald Douglas, Jr. in starting a factory model shop. (Victor Pastushin will be the subject of a future article on “Airline Ashtray Models”) Donald Douglas, Jr. has always been credited with the establishment of the Douglas Factory Model Shop, which, however, was always kept as a separate entity by Douglas, Jr. from the Douglas Aircraft Corporation itself. The first Douglas Model Shop has always been believed to be operated in the Douglas Aircraft Santa Monica, California plant. It is unclear, however, if there was an actual Aluminum foundry located on Factory premises. An Aluminum foundry incorporates a furnace to melt Aluminum that is then poured into sand molds. More than likely a foundry located somewhere in the Los Angeles basin, already producing airplane parts for Douglas, did the actual casting. Workers at the model shop would then laboriously file out and hand polish the sandcast models before the applying paint and decals. 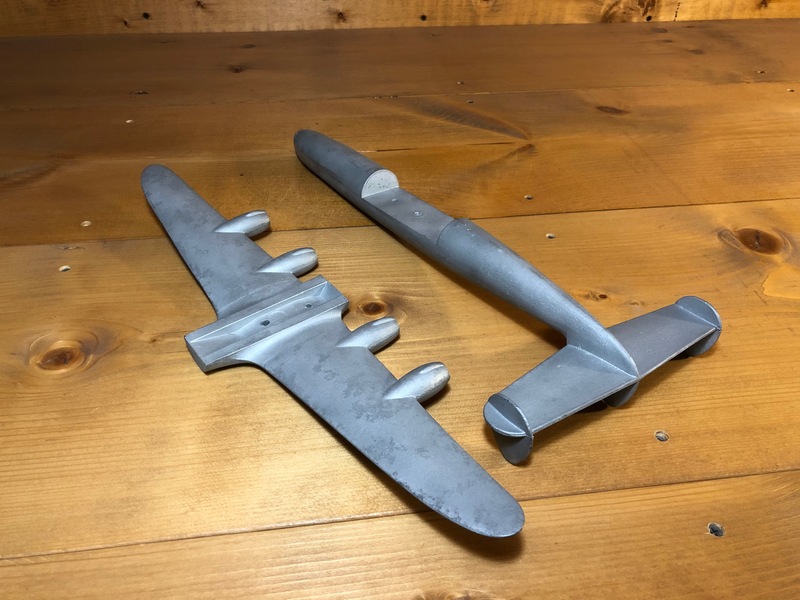 The same Zinc Chromate primer, and finish enamel paint used on real Douglas aircraft, were used in finishing the models. Decals were produced using high quality water transfer decal sheet and Airline livery colors were applied using the silk screen process. It is known that the DC-2, DC-3 and DC-4 models were actual sand castings. 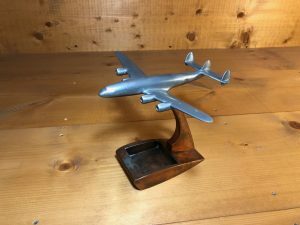 Beginning with the DC-6 models, very expensive permanent molds, made of tool steel, were used to cast the models. 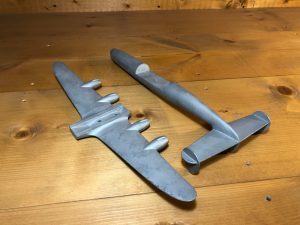 A sand core was placed inside the fuselage mold to make the model hollow, and lighter. Permanent molds were used to cast all models from the DC-6 to the DC-8-63. Most of the Douglas models were cast in 1/50th scale. This scale was the most common size desired by Airlines and Travel Agencies. 1/72nd models were also produced but were less popular. The early DC-2 models were produced in larger scales. It should be noted that the Douglas factory also produced models of its Military aircraft (C-124s, C-133s, B-66s, etc.). 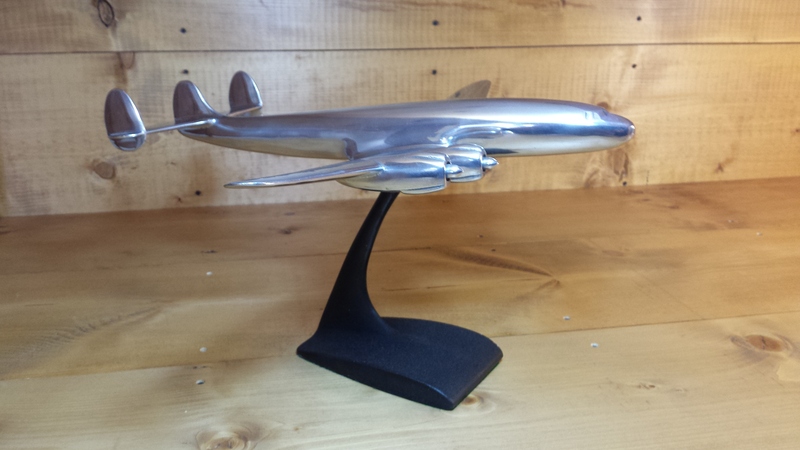 The Douglas factory produced Aluminum models from 1934 to 1966. After 1966 Douglas models were produced by a company called Marketing Aids located in Anaheim, California. Marketing Aids produced mainly DC-9s, DC-8-63s, and DC-10s in fiberglass and plastics. 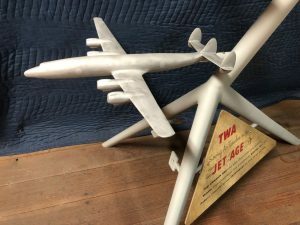 Marketing Aids inherited a great number of unfinished Aluminum models (blanks) from Douglas, along with a huge inventory of Douglas factory decals. They also had acquired many leftover finished Aluminum models, some of which were sold to private individuals. With the merger of Douglas with McDonnell (forming McDonnell-Douglas) in April of 1967, the era of the Douglas model came to an end. Marketing Aids continued to produce some models for McDonnell-Douglas for a short time. The remaining inventory of Aluminum Douglas model blanks, decal sheets, and fiberglass models were either sold off or simply thrown away. 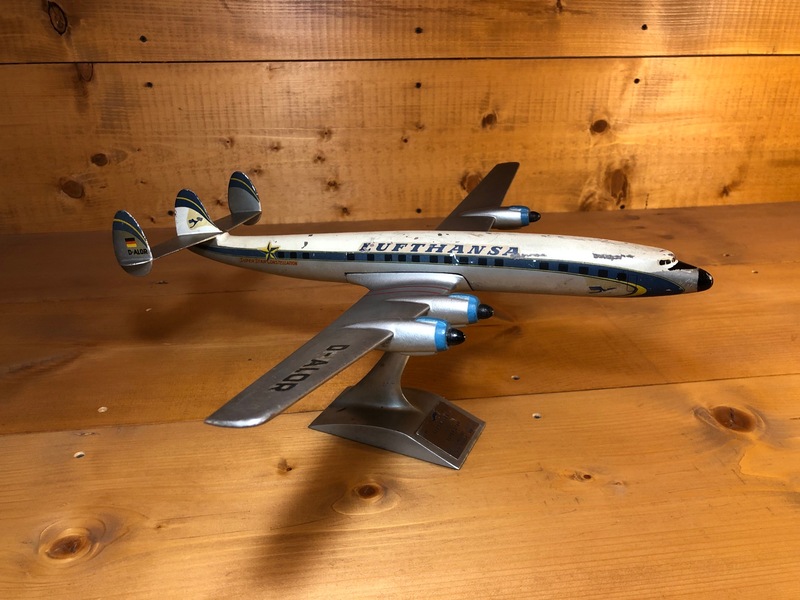 In conclusion, the models produced by the Douglas factory, and later Marketing Aids, are highly regarded by collectors and Airline historians. Noted for accuracy and correct scale, they are a prized addition to any model airliner collection.